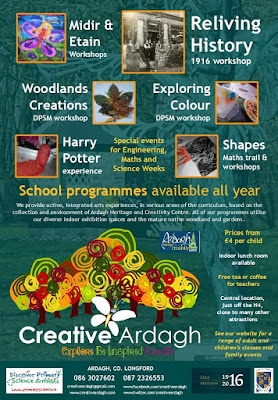 We are delighted to be able to offer a new workshop for schools and other interested groups throughout 2016 in association with the 1916/2016 Longford Committee. We will also host a special family day on Saturday 21st May (watch out for more details). Travel back in time with us and experience what life was like for children in Longford 100 years ago. What Longford people took part in the Easter Rising? How did the arts inspire change at the time? All participants will get a chance to make their own art piece to take with them (options include printing, collage, clay and fabric and fibre). This is just one of several workshop options available for schools and other groups of all ages from toddlers to adults. See more here and here. €5 per person for groups less than 10, €4 per person for groups greater than 10. 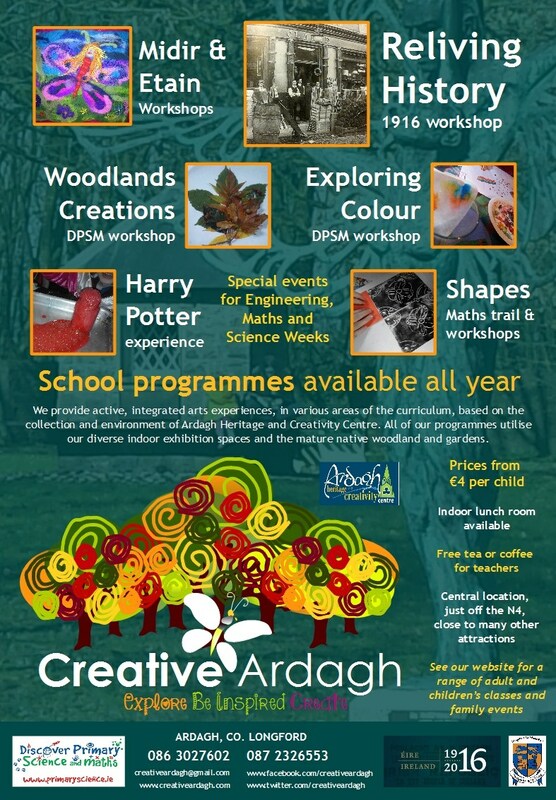 Email: creativeardagh@gmail.com or call Annette on 086 3027602 or Ann on 087 2326553 to book your tour or find out more.